I have been running an Austone on the rear of my bike for a bit over 20K miles and two years. My tire looks better than the pic that Chromo(at 18k) linked to. I've been chicken to run rear tire backwards on the front and I'm well pleased with the Bridgestone Exceda Max RADIAL that I run on the front. It's finally approaching the wear bars @20K, without cupping. I choose to run the radial to better match the Austone, although a bias front will work well also. Contrary to the desk jockeys, I didn't crash and burn, and noticed a bit better handling and ride, but a huge difference in wet performance. tar snakes and grooves are a non issue anymore, although I will admit you have to be careful of uneven pavement at slow speeds as it will push the bike towards it's side, but you get used to that pretty soon and learn to avoid it. For me, going to a CT (Austone) was easy. Too many people have already done it, with positive results. The question of 'is it better' isn't really it. It's not better. Not worse. Just different. The sensation of turning on a CT is different, to be sure. But it is very subtle, and easily adjusted too. If the air pressure is in the 30's, there is a bit of "squirm" when turning and hitting the gas after a shift. Raise the pressure and it goes away. I settled at 42 psi. My initial impression after install, was at 35psi. And it felt rather weird. But holy cow, the ride difference was phenomenal going down the road. Quiet. Smooth. Even effortless because of the tire height. Shift points changed, and I have found myself on more than 1 occasion forgetting to hit 5th. How much of the quiet smoothness could be attributed to just having new tires is unknown to me. No matter what, I have nothing negative to say about it. I have only gone about 2000mi since install, so the tire still looks new. If you are wanting negatives as well as positives (Not CT bashing but experience report). I wanted and still want to go darkside. Just waiting for a tire that is the same size as oem. I tried the Austone on my 93. Also went with the reversed front Pilot Activ ?? We did the same with a friend, another member here, and he experienced the exact same problems. There are others here that have reported the same. At least 6 that I know of. We did all the mods to make it fit without rubbing. Tested with at air pressures from 35 to 60 lbs.With the Austone my bike wanted to follow every crack in the road. Tracked the ridges on rain grooved roads. Buffeted terribly (scary) in head winds. Above 80 mph she felt like she was trying to lift off. (also scary). On rough roads I could smell plastic burning from the rubbing. I even put my old E3 back on the front to see if that would solve the problem. We returned the tires to the supplier for evaluation and they reported there were no defects with mine or my friends tires and returned our money. Oh! I had over 500 miles on the Austone before I removed it so I gave it a chance. Not all is peaches and cream for everyone with the Austone. I wonder how many have said problems and are just living with it. If so please report that also. Before any suggestions that the bike has another problem, it doesn't. Everything is serviced properly and regularly, suspension front and rear, swing arm, wheel bearings, everything. The bike has none of above symptoms with E3s or now Avon Venoms. Oh yes I want both sides of the story and I was wondering if anyone uses the other types of tires. Do your research before you try it. Be wary of those who run Darkside on a GL1800 - their experience will differ from those of us running Darkside on GL1500's. I have the Progressive 450 IAS on the rear coupled with the OEM Air shock. I am 300# and ride solo most of the time 99.5%. I average in excess of 15,000 miles per year usually although that has gone down recently to more like 11,000 per year for the past 2 years. I am a sedate rider who has the ability to drag pegs (and has done so in Colorado, The Smokies, and Canada) but I prefer to ride the back highways of America - taking it easy. If I am dragging pegs I am going too fast. I have a Unigo that I rarely trailer - I typically will load up the bags & trunk and rear seat to travel. I currently have 26,000 miles on my Rear Vredestein Comtrac 175-75 Darkside tire. I placed it in service as a way to avoid changing tires once or more every year. I burned through 3 sets of Michelin Pilot GTs in less than 3 years , and although those were the best tire for a 1500 ever made - they are discontinued - so I wanted to try the "Darkside"
The rear Tire is a 6 ply lite truck tire. Max PSI is 69 but I run it at 44 to 48 depending on loading. Load rating is like 1800+ lbs. A stiff radial tire. My rear rides well - for long highway stretches or back road cruising it is excellent. Longevity, grip , quietness, - all exceptional. Longevity - ? to be determined as of now...Easily another 10-15K so nearing 40K. Handling at speed is fine. The tire WILL wander UP the crown sometimes and others push away from the crown. You get used to it and it is no big deal. Slow speed riding with a car tire is easier except when you get into sever sloped situations, like a curb, or a pothole where the rear will want to ride 'flat' and that can cause you to steer or lean in an uncomfortable way. 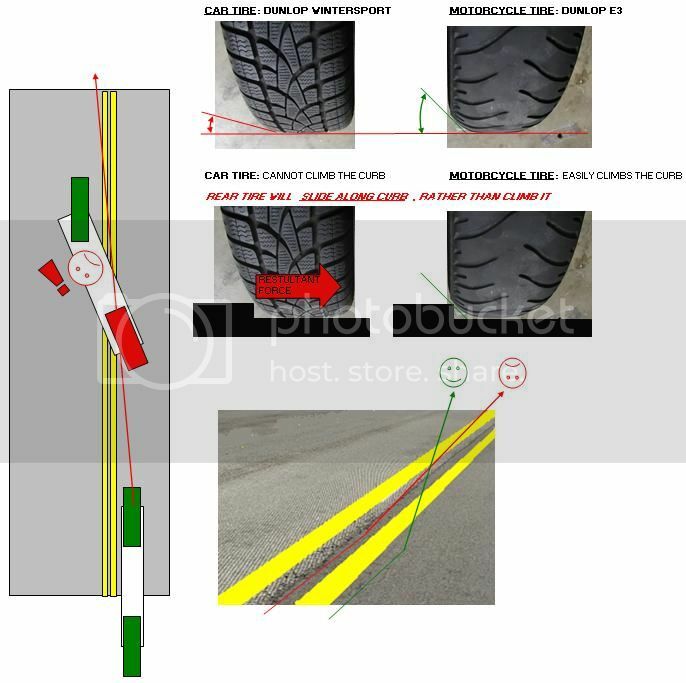 I HAVE had a situation where the rear tire caused me top steer into a curb on a leaning slow speed turn. I actually ground the underneath exhaust heat shield along the curbing for 10-15 feet as I regained complete control. It was my fault, I eased away from a stop sign too slow, lost momentum on an uphill leaning grade and over-steered to the road edge. There is a LOT to like about the Darkside rear tire. You are always steering the bike into-through-and out of corners. The rear tire wants to stand up to the flat spot . No "set-it and forget it cornering like a motorcycle tire. The oversteer-understeer phenomenon is something to be aware of. The rear tire has so much grip it can feel like a 'push' sometimes (think racing terms push). It is different - just be aware. My next set of tires will be Motorcycle specific tires. Not because the Darkside is bad or dangerous or anything. I just do not see the significant advantage for ME. My idea was to take a LONG trip on the car tire to see the southwest . Racking up many miles before coming home. That never happened and perhaps never will so this idea is being shelved for now (due to social economic conditions currently in my life). Ask me any question - I would be happy to share my experience - I hope this helps. My CT experience is limited to the Dunlop Wintersport, which unfortunately is no longer made in the 175/60/16 size usuable on the 1500. I have put aprox 60k miles one 3 Wintersports so far, and just mounted up another yesterday. I love, love Love this tire. I have several as spares, and also have them mounted on friend's 1500 as well. For while I was alternating weekly between both my 1500's, one with CT, the other with (Dunlop E3) mcycle tires. I originally went to a CT due to having multiple E3's develop Cracks, which I presumed to be due to Overloading. I have not had that problem at all, with the CT.
-Longer life (~20k miles vs 10-15 for E3) for Center of tire. -Dangerous slides possible (see figure below) when approaching small raised edges at shallow entry angle. Easy to avoid, when you know what to look for. -Edges wear out fast, if you do a lot of curvey riding. I can honestly tell you that riding with a ct and also a mt my bike does'nt feel any different at all. My car tire is a little taller so I have to run a little more air in the rear shock so it does'nt rub going over rough railroad tracks. Strangely the extra height should have lowered the rpm enough to improve mileage but having run several tanks through the bike it gets exactly the same mileage as before. If I did'nt know it had a car tire I'd never know. My son has way less experience and he could'nt tell when he rode it. Even a bad day riding is better than work.